Towing a caravan is one thing, overtaking while doing so is another. Many factors come into it, from safety to the power of your towing vehicle. In this article from Colin of the Caravan Council of Australia, he takes a closer look at the safety aspects of overtaking while towing a caravan, taking into consideration speed, power, and acceleration. It is quite a technical article for those that way inclined but explains the concepts very well. reasonable speed when climbing hills. into trouble, for example when overtaking another vehicle. It is also vital that you are able to stop at a reasonable rate… safely, and in a straight line. determine the overall distance required for over-taking, for every tow-vehicle – caravan situation. with enormous risks… are you prepared to pay this horrendous price??? slower vehicle safely, in the prevailing atmospheric and road conditions… do not attempt to overtake. performance of their tow-vehicle, when towing a loaded caravan. “Acceleration” is what we need to increase speed, in order to over-take a slower vehicle. “Mass” is the total mass of the car-caravan combination. “Force” is the forward thrust – “tractive effort” – supplied by the car tyres’ traction on the road surface. the car alone… hence the “Acceleration” performance will be considerably reduced. The “Force” is the horizontal force available, hence it will be considerably reduced on an incline. will be considerably reduced on wet roads and dirt roads. the left lane, behind the vehicle that you are over-taking. other situation requires you to stop the planned manoeuvre, and you need to brake heavily. plan views). The drawing is not to scale, as LA and LD are relatively much longer than LV and LT.
* V1 and V2 show the car-caravan combination, before and after the overtaking manoeuvre. * T shows the vehicle being overtaken. * LV is the length of the car-caravan combination. * LT is the length of the vehicle being overtaken. * LA is the “acceleration” distance. * LD is the “deceleration” distance. * L is the total distance needed for a safe overtaking manoeuvre. acceleration and speed of “V” – in order to over-take safely, and move back into the left lane. required… along with the time spent in the “wrong” lane. and the two (“before and after” over-taking) “Safety Factors” must be added. 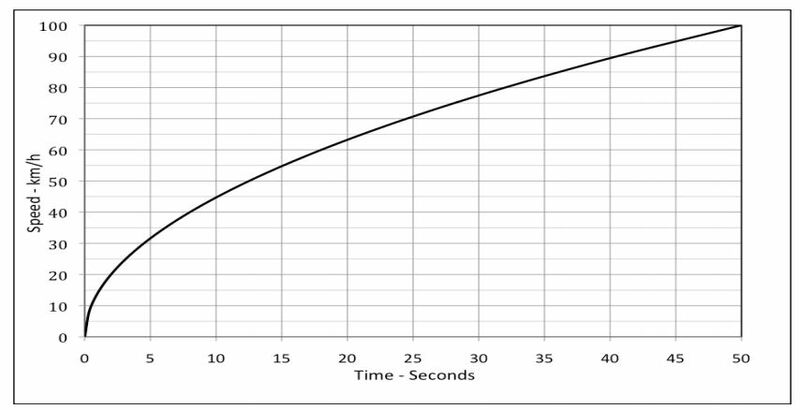 The “air-drag” increases with the square of the speed, hence the acceleration rate is reduced. The “inertia” (momentum) of the combination also increases with the square of the speed. The engine “power” required increases with the cube of the speed. correct units are used so that each side of any equation precisely “compares apples with apples”! Hopefully, you will never be caught in a “tight spot” (read, “dangerous situation”) when over-taking. * Ensure that both the tow-vehicle and the caravan are in good mechanical condition. * Ensure that all tyres are correctly inflated to the prescribed pressures. * Ensure the caravan brakes are operating efficiently and evenly. * Load the tow-vehicle as you normally would for a trip. * Just for this test… Load the caravan to its legal limit… in a “reasonable and typical manner”. * Use a certified weigh-bridge to measure the: (a) All-up load; (b) Axle(s) load; and (c) Ball-load. a level, deserted, 3-lane (in each direction) freeway. * Check the accuracy of the speedometer using a good GPS unit. sway at the higher speeds. * Record – or calculate – the distance travelled between each 10 km/h segment. vehicle, when you wish, or need, to. combination. 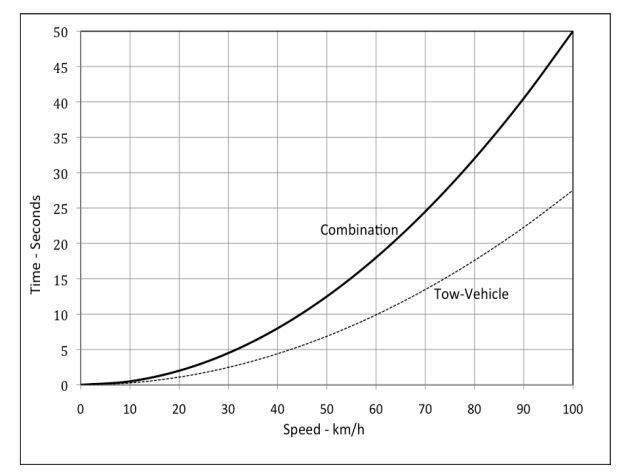 The broken line shows a typical “Acceleration Curve” for just the tow-vehicle on its own. the non-turbo diesel engine of a popular 4WD tow-vehicle being around 4.0 litre capacity. mentioning any vehicle Makes and Models). should the caravan start to sway or snake. 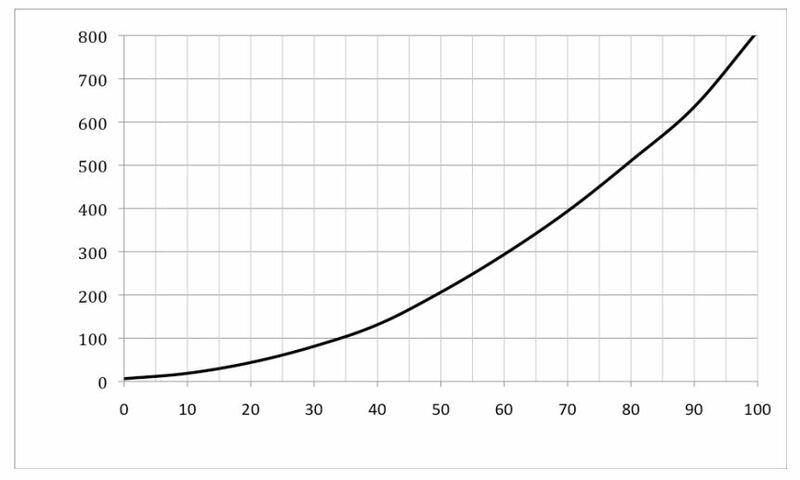 The graph shows the inverted typical “Acceleration Curve” for a combination. the “integral” (area under the curve) reveals the distance covered. speed limit… or such a high speed that the ‘van becomes dangerously unstable. them, and hopefully reduces their speed to assist you. it is advisable to alert them of your intention. wide enough, and does not have very rough edges. increase in speed. Check your mirror carefully to ensure that you are not about to be over-taken. do not rely on the turn-signals of the vehicle being over-taken, as a “safe to over-take” signal. hazardous sway… possibly ending in a dangerous “jack-knife”. even more-dangerous effort to pass you. brake heavily, to better-allow the driver to quickly cut back in front of you, so as to avoid a lethal headon collision. Disclaimer: This information is provided in good faith, in an effort to improve road safety. It is believed to be correct, but no liability whatsoever is accepted for any issues arising from using this information. Original article provided courtesy of the CCA – www.caravancouncil.com.au – The CAA is a completely independent, non-profit, non-commercial body that provides free no-obligation compliance and technical advice to all manufacturers, importers, dealers, mechanics, owners and potential buyers of recreational vehicles. You can contact the CCA direct or visit their web site via the links below.